Welcome to Make It Monday with Kraft Outlet. Use this week's "Pop of Color" to inspire you to create your project and then link it up at the bottom of this post before 6:00 p.m. (Eastern Time) on Sunday May 5, 2013. Remember your projects MUST include the use of Kraft cardstock and/or items that can be purchased at Kraft Outlet! Also, all of our followers who participant in our challenges this month have a chance to be featured on our "Feature Me Fridays" posts as well as be entered to win a $15.00 Kraft Outlet Store Voucher! Please limit your weekly challenge entries to your TWO best creations and thank you for your participation! For today's "Pop of Color"challenge, Tammy created a decorated bag for the upcoming Teacher Appreciate Week using Red as her Pop of Color. She started with the Medium Kraft Paper Sack from The Kraft Outlet. 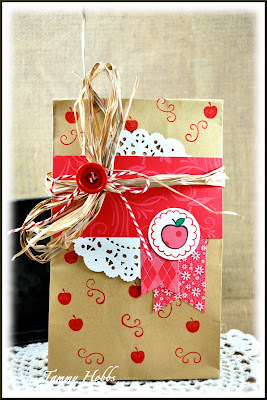 Using an apple stamp and Mini Swirl Flourish stamp from DeNami Designs, she randomly stamped the bag using Real Red ink from Stampin' UP!. To soften things a bit, Tammy added a white doily to the center of the decorated Medium Kraft Paper Sack. She further decorated by adding some red patterned papers from her scrap stash, a cute little paper-pieced apple inside a stamped scallop circle also from DeNami Designs. Her final finishing touch included taking a length of Wraphia ribbon and wrapping it around the center tying in a bow and embellishing with some Red Baker's Twine and a button to complete the look. Please visit Tammy's blog, Creating Somewhere Under The Sun for additional pictures and information. 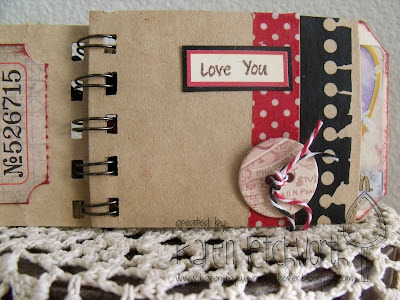 Jessica loves Monday's when the new Kraft Journal challenge begins. Based on the theme for this week, Pop of Color, Jessica made a CAS card using several products from The Kraft Outlet. 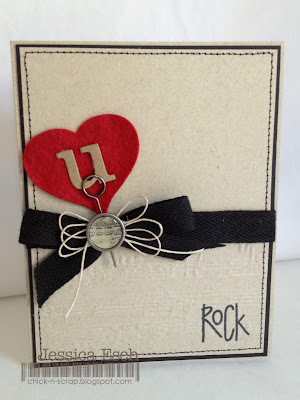 Her music inspired card starts with a Brown Kraft Cardstock , which she embossed the bottom half using a Tim Holtz music embossing folder. Before adding some Black Twill Tape to cover the start of the embossed part she ran her mat layer through the sewing machine to give a decorative border. Once the Black Twill Tape bow was tied, Jessica added a triple bow using some Natural Hemp Cord. To cover the knot of the hemp cord and keeping with the music theme, Jessica used the Custom Fasteners to make her own music note brad. Finally she die cut out the heart using some red felt and the letter "u" using some Chipboard and attached them both using a Memo Pin poked through the ribbon. For more details and additional pictures, you can visit Jessica's blog~ Chick-n-Scrap. For this week's Pop of Color Challenge, Karen Letchworth decided to make a tiny album using the adorable Mini Kraft Merchandise Bags which she bound together with a binding machine to create a little keepsake and gift card holder album. Karen used some Jenni Bowlin Paper Edged Rub-Ons, some black and red Baker's Twine, Jenni Bowlin Chipboard Office Buttons, Tim Holtz Adage Tickets, Tim Holtz Journaling Ticket (great for journaling in these little mini albums), some Natural Twill Tape Ribbon along with some seam binding tied on the binding, and some Red and White Polka Dot Washi Tape from our WONDERFUL selection of washi and decorative tapes available at The Kraft Outlet. Oh how funny I didn't even think that I used red as my pop of color also until I read Tammy's comment-- I must have definately been inspired by all of your beautiful work! Thanks for another fun challenge. Can I just say that we have an awesome Design Team? I am so in love with everyone's projects, and I'm excited to see all of the wonderful entries this week.